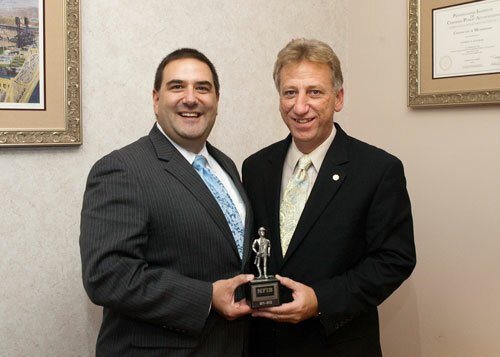 Rep. George Dunbar (R-Westmoreland) accepted his 2012 Guardian of Small Business Award from Pennsylvania National Federation of Independent Businesses (NFIB) State Director Kevin Shivers. Dunbar is among a select group of only 12 state lawmakers to earn a 100 percent ranking from the Pennsylvania NFIB during the 2011-12 legislative session. HARRISBURG – Rep. George Dunbar (R-Westmoreland) is among a select group of only a dozen out of 253 state lawmakers to be recognized as a Guardian of Small Business for his 100 percent small business voting record during the 2011-12 legislative session by the Pennsylvania chapter of the National Federation of Independent Businesses (NFIB). “Guardians of Small Business” designations are awarded to legislators who consistently vote favorably on key small business issues at least 75 percent of the time. According to the NFIB, Dunbar supported small businesses and job creation 100 percent of the time during the 2011-12 legislative session on such high priority issues as legal reform and regulatory relief; tax and fiscal policy; and unemployment and workers compensation reforms. Please visit www.RepDunbar.com or www.Facebook.com/RepDunbar for the latest legislative updates.